The American Red Cross will hold a blood drive Monday through Wednesday, Feb. 2-4, from 11 a.m. to 5 p.m. on Main Campus. The blood drive will be held in the Student Union Ingman Room on Monday and Tuesday. On Wednesday, the blood drive will be held in the Student Recreation Center Oak Room. “Our goal is to collect 300 units of blood a year; that supplies 24 hospitals in the western Lake Erie region,” Holland said. Donors are encouraged to schedule an appointment, but having one is not necessary. To schedule an appointment, visit redcross.org and enter sponsor code UTMAIN. Those who participate will receive a coupon for a free Chipotle burrito. Volunteer opportunities are available as greeters, escorts and canteen supervisors. To volunteer, contact Jennifer Hughes, donor recruitment account manager of the American Red Cross Western Lake Erie Region, at 419.764.4168 or jennifer.hughes@redcross.org. Toledo will hold its seventh annual “Rockets For the Cure” sponsored by Kroger Saturday, Feb. 7, as the Midnight Blue and Gold entertain Ball State at 2 p.m. The Mid-American Conference West Division match-up will benefit the Susan G. Komen for the Cure of Northwest Ohio and the Eleanor N. Dana Cancer Center. The Rockets encourage everyone in attendance to wear pink in support of cancer research. Groups that purchase 15 or more tickets may do so for $6 each. The first 500 group tickets purchased will receive a free “Rockets for the Cure” commemorative T-shirt. Tickets also will be sold for a raffle throughout the game. Immediately following the contest, guest emcee Chrys Peterson will host a live auction for the UT players’ pink game jerseys. 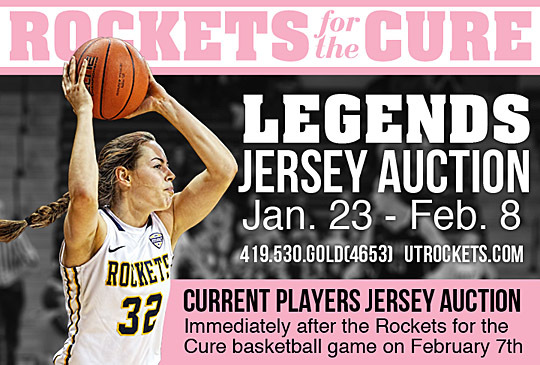 Two additions to this year’s event will be a Legends Online Auction and an opportunity for fans to make an extra donation to cancer research based on UT’s accuracy at the charity stripe. The auction will run through Sunday, Feb. 8, on utrockets.com. Fans can bid on legend jerseys of Kahli Carter, Kim D’Angelo, Tia Davis, Dana Drew, Angela Drake, Latoja Harris, Courtney Ingersoll, Linda Janicki, Lucretia LeGault, Kim Knuth, Mimi Olson, Yolanda Richardson, Courtney Risinger, Jane Roman, Kelly Savage, Kim Sekulski and Naama Shafir. In addition, Head Women’s Basketball Coach Tricia Cullop will donate $25 for every free throw the Rockets make during the game, and she is asking fans to match it. Last season, Toledo raised $13,582 for breast cancer research. Six of the Nike uniforms that were auctioned off after the contest went for more than $1,000, including a high of $1,500 for Ana Capotosto. Huntington Bank presented scholarships totaling $10,000 to five University of Toledo College of Business and Innovation students last week in the Huntington Sales Lab, located on the fourth floor of the Savage & Associates Business Complex. The recipients are graduate student Cassandra Wenman ($3,000) and undergraduate students Paviele Pena ($2,000), Kaleigh Rapp ($2,000), Jae Huth ($2,000) and Boram Kim ($1,000). Receiving scholarships funded by Huntington Bank were, front row from left, Cassandra Wenman, Boram Kim, Paviele Pena, Jae Huth and Kaleigh Rapp. Also in the photo, back row from left, were UT Business Dean Gary Insch, UT Business Senior Associate Dean Terribeth Gordon, Schmidt School of Professional Sales Director Deirdre Jones, and Jon Grimm, John Harvey, Ronnie Wolfe and Joel Jerger of Huntington Bank. Through an expanding banking program between Huntington Bank and UT, Huntington is providing $150,000 in academic programming and scholarships for students and additional convenient banking options on campus. In an effort to promote and aid budding medical faculty research, The University of Toledo is creating a society that will grant funding for biomedical projects. The University of Toledo Medical Research Society supports biomedical research through a community-university partnership by funding grants for promising UT faculty. The society has already gained 12 members who made $25,000 commitments and garnered a $1 million matching donation from The University of Toledo Physicians (UTP). UTP, a not-for-profit physician group dedicated to providing the highest quality, efficient health care in a patient-centered environment, agreed to match the commitments of up to the first 40 members and put it toward the growth of the society. Dr. Christopher Cooper, senior vice president for clinical affairs and dean of the College of Medicine and Life Sciences, is one of the first members of the society and UTP chairman. “Biomedical research is critically important for the College of Medicine,” Cooper said. “It is in the process of discovery that we create a better world. The Medical Research Society acknowledges the importance of funded research and will provide critical support for early career investigators who are transitioning to scientific independence. The society was started by Marianne Ballas, a longtime supporter of the University. Ballas, who owns Ballas Buick GMC on Central Avenue, is the chair of Women & Philanthropy at UT. Under her leadership, the organization was created to support the work of medical faculty members who are progressing into scientific research careers. The goal is to create a permanent endowed source of seed funding for biomedical research projects developed in the College of Medicine and Life Sciences, Newman said. Newman explained that the National Institutes of Health (NIH) used to fund more than 25 percent of the grants applied for by junior faculty, but in recent years the number has decreased to 10 percent due to reduction in federal funding. For this reason, it is difficult for young investigators in the country to obtain funding for research, which is why the society is aiding these individuals. Once researchers have received funding, it’s easier to get renewal funding, he said. “Once you’ve demonstrated that you have more than a good idea, that you have in fact a good idea substantiated with data, then your opportunity to go back to the NIH and be competitive and get funding is greatly enhanced,” Newman said. In the next year, the society is hoping to have 75 members and award its first grant. For additional information or to become a member, contact Newman at 419.383.6840 or howard.newman@utoledo.edu. UT employees can now download their 2014 W2 statements online through the myUT portal. Employees can view and print copies of their W2s from the tax forms option in the employee tab. Click on the W2 wage and tax statement link, select the tax year 2014 from the drop-down menu, and click the display button. A “printable W2” button also is available on the bottom of the page. W2s will be mailed Jan. 30 to employees who did not opt to receive the statement online. 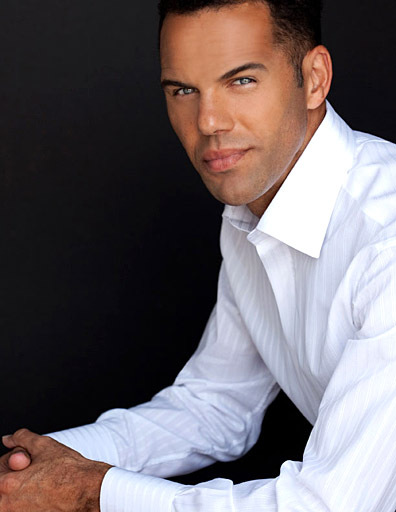 Business leader and child advocate Steve Pemberton will be the keynote speaker at The University of Toledo’s 31st annual Aspiring Minority Youth Conference Saturday, Jan. 31, from 8:30 a.m. to 1 p.m. in the Student Union Auditorium. The conference titled “Embracing Diversity: Understanding the Reality of 21st Century” is designed for sixth- through 12th-grade students, parents and community members. “Our theme this year focuses on how critical it is that young people begin to understand the diverse and global world that they are a part of and how critically important it is for them to engage with and understand people who are different from themselves,” David Young, director of the UT Office of Excellence, said. Pemberton, chief diversity officer and divisional vice president for Walgreens, is considered one of America’s most inspiring executives. Despite setbacks, he has been successful in both his personal and professional life by utilizing opportunity, access and equality. Pemberton’s inspiring journey from foster care to finding his biological family is shared in his memoir, A Chance in the World: An Orphan Boy, a Mysterious Past, and How He Found a Place Called Home. After the general session featuring Pemberton, there will be a session for parents and educators titled “Fostering and Maintaining Healthy Lifestyles for the Whole Family,” which is designed to encourage parents to discuss nutrition and exercise with their children and be proactive about health and wellness. Students will attend a concurrent session on “Ethnic Diversity: Overcoming the Negative, Reinforcing the Positive.” A Toledo Excel alumni panel will lead a discussion to encourage students to celebrate diversity and take pride in their ethnic backgrounds. A free lunch will be provided for all attendees after the last session. The conference is hosted by Toledo Excel, which was established in 1988 and has since helped prepare underrepresented students in higher education for success in college. To make a reservation for the free, public conference, click here or call 419.530.3823. All UT Health patients now have around-the-clock access to their medical records from the privacy of their homes. Last week, UT Health launched the Athenahealth patient portal for outpatients. Inpatients at The University of Toledo Medical Center already have access to their medical records through the RelayHealth patient portal. In addition to viewing their health information, patients can request refills and pose questions to their health-care team through the portal. Another feature of the Athenahealth patient portal is the ability to send mass communications to patients, such as if there is a Level 3 Snow Emergency. Dacre said she would like to thank all of the UT Health physicians, nurses, caregivers and information technology experts for their work over the last several weeks learning the new system, as well as the staff who helped launch the new Athenahealth patient portal. Dave Morlock, CEO of UT Health and executive vice president of finance and administration, echoed these sentiments. For more information or to register for a patient portal account, visit uthealth.utoledo.edu. Starting on Sunday, Feb. 1, The University of Toledo will participate in RecycleMania, an eight-week international recycling competition. During the next few months, more than 300 schools across the United States and Canada will promote waste reduction activities on their campus communities through this friendly event. Each week UT will report the weight of recycled materials collected in order to be ranked in various categories. At the end of the contest, winners will be chosen in each of the nine categories and will receive an award made out of recyclable materials. “Last year, UT ranked in the top three against other Mid-American Conference schools in various categories and ranked 17th nationally in the electronic recycling category,” Mason said. In conjunction with the competition, UT hosts an internal contest between residential halls. Carter Hall won last year’s competition, followed by Ottawa Hall and Academic House. A community electronics recycling day will be held at UT Saturday, March 21, from 10 a.m. to 1 p.m. in parking lot 28 by Plant Operations and the south entrance to Main Campus. Electronics — except for TVs — will be accepted and disposed of in an environmentally safe manner. For more information, visit recyclemania.org or contact Mason at brooke.mason@utoledo.edu or 419.530.1042. A group of University of Toledo students traveled to the 15th National Conference and Global Forum on Science, Policy and the Environment this week. “Energy and Climate Change ” is the theme of the conference, which runs from Tuesday, Jan. 27 to Thursday, Jan. 29 in Washington, D.C. The group, led by Dr. Andy Jorgensen, UT associate professor of chemistry and environmental sciences, traveled by train in an effort to keep their carbon footprint low. Jorgensen said it was encouraging to hear President Obama mention climate change in the State of the Union address. “Our students are right in the middle of this issue. They have an important role to serve in their future careers, and they are part of the solution,” he said. The group also has a scheduled meeting in the office of Congresswoman Marcy Kaptur, who represents Ohio’s Ninth Congressional District and has served since 1983. “I hope the students get a sense of the larger world in this field of the environment and what we can and must do to protect the world,” Jorgensen said. Attending the conference from UT are Michaela Margida, a doctoral student in environmental sciences, and undergraduate engineering students Meri Mullins, Ben Nielsen, David Krane and Ryan Oaks. The undergraduates are participants in UT’s Building Ohio Sustainable Energy Future Program, which is funded by the Ohio Board of Regents. Keynote speakers at the conference include Bill Richardson, former secretary of energy and U.S. ambassador to the United Nations; Gina McCarthy, administrator from the Environmental Protection Agency; Gérard Araud, ambassador of France to the United States; and Franklin Orr, undersecretary of science and energy in the U.S. Department of Energy. Jorgensen and the students would like to thank the deans of the college of Engineering and Natural Science and Mathematics, the Office of Research, the director of undergraduate research, and Dr. Geoff Martin, head of the Building Ohio Sustainable Energy Future Program, for making the trip possible. The first Humanities Happy Hour of the spring semester is set to have a flair for international film. Dr. Ruth Hottell, professor of French, and Dr. Friederike Emonds, associate professor of German, will speak Friday, Jan. 30, from 6 to 7 p.m. in the Libbey Hall dining room. The free, public event will begin at 5 p.m. with a cash bar and free refreshments that will continue through the talks and end at 8 p.m.
Hottell’s talk, “Francophone Women Filmmakers,” will explore images of women in French films. Throughout French literature, there are very few uplifting depictions of women; they are usually only there to assist the male characters, Hottell said. According to Hottell, women have directed 23 percent of the films in France, which is the second highest ratio worldwide. Two of these francophone women, who will be the focus of Hottell’s talk, are directors Agnès Varda and Marjane Satrapi. Varda was involved in the French new wave, a movement that began in France where the directors also became the authors of their films. This movement became a mainstream influence in the 1960s and continues to be prevalent in modern film. Satrapi began her career more recently, beginning with the filmed version of her graphic novel, “Persepolis” in 2007. Hottell co-authored several books, including Noteworthy Francophone Women Directors and Francophone Women Film Directors: A Guide with Dr. Janis Pallister, a former professor of romance languages at Bowling Green State University, who passed away in 2008. In these books, the pair included research and their own interpretation on films directed by francophone women. Film is a topic that also will be covered in Emonds’s talk, “The Future of Memory: 70 Years After Auschwitz.” Memory studies is a class of research that focuses on how long a person remembers something and the significance it holds in their mind by comparison with how long since the event has happened. Tuesday, Jan. 27, was the 70th anniversary of the liberation of the Auschwitz concentration camp. Emonds said that thousands of survivors used to gather at the camps to commemorate this day, but as they are growing older, more are dying or unable to attend. The purpose of memory studies is to find alternate methods of preserving these accounts. Two of the most popular methods are digital recordings of survivors and films. However, there are issues with both methods. Digital recordings aren’t as moving or effective as talking to the person in real life, and films are often falsified and not authentic, Emonds said. While she said she doesn’t claim to have the answers, Emonds suggests changing the style of films that are created. She cited the film “And Along Come Tourists” directed by Robert Thalheim — a German film focusing on the lives of two young adults living and working in Oświęcim, the Polish town next to Auschwitz — as a good place to start. Humanities Happy Hour was started spring 2014 by the Humanities Institute in the College of Languages, Literature and Social Sciences. The institute serves as an advocate and support for the study of human cultures at UT. For more information, contact the Humanities Institute at 419.530.4407 or HumanitiesInstitute@utoledo.edu.